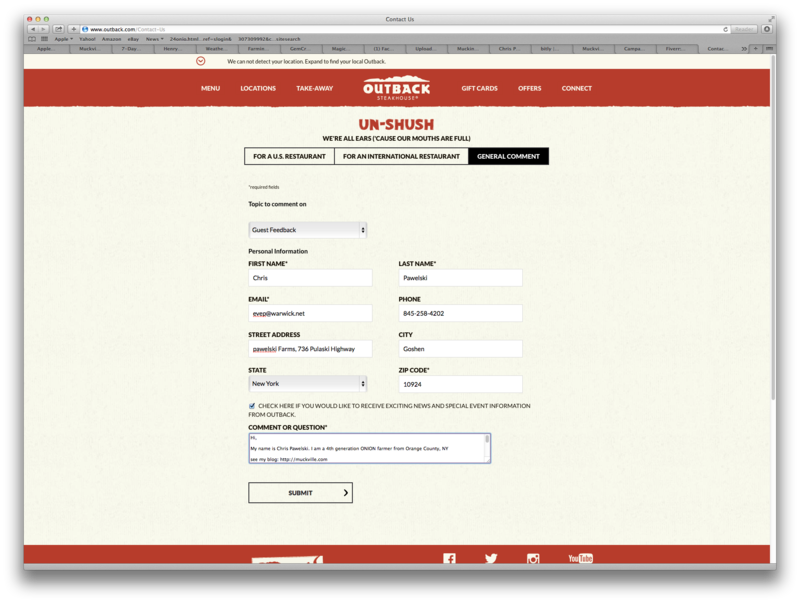 Iowa to play LSU in the Outback Bowl … and I want a free Bloomin’ Onion from Outback Steakhouse! It’s official … Iowa will play LSU in the 2014 Outback Bowl! The last time we played LSU was in the 2005 Capital One Bowl and we sent out coach Nick Saban as a loser at LSU in until the Iron Bowl this season was one of the best endings to a college foot ball game … evah! Now here is the deal … I’m a 4th generation ONION farmer and a very proud graduate of the University of Iowa (1988-1990, M.A.) … and because of these two things … I WANT A FREE BLOOMIN’ ONION! 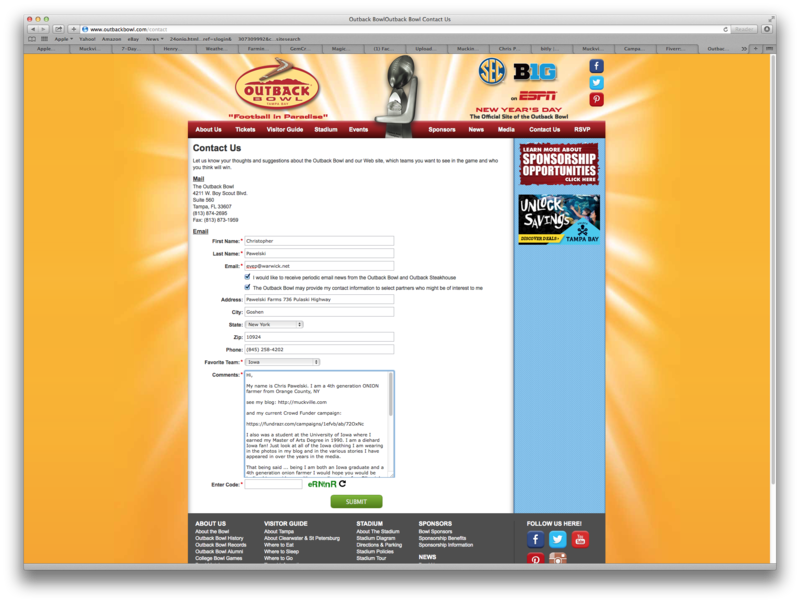 Tonight, shortly after the announcement was made of the fact that Iowa was selected to appear in the Outback Bowl I sent the following e-mail to both the Outback Bowl website and the Outback Restaurant website (screenshots of both e-mails below). Let’s see how these guys respond … I will keep you all posted! I also was a student at the University of Iowa where I earned my Master of Arts Degree in 1990. I am a diehard Iowa fan! Just look at all of the Iowa clothing I am wearing in the photos in my blog and in the various stories I have appeared in over the years in the media. That being said … being I am both an Iowa graduate and a 4th generation onion farmer I would hope you would be inclined to provide me with a complimentary free Bllomin’ Onion, being that Iowa will be one of the teams in the 2014 Outback Bowl (http://www.outback.com/menu/bloomin-onion#.UqUl4JHFOYA). I will be posting about this quest to receive a free Bloomin’ Onion in my Muckville blog some time tomorrow (December 9, 2013). I can send you the link upon request. University of Iowa graduate and 4th generation onion farmer! PS: Feel free to support my The Crowd Funder Show campaign to raise enough money for an editor for my memoir “Muckville: Farm Policy, Media and the Strange Oddities of Semi-Rural Life.” All contributions are very much appreciated! This entry was posted in Uncategorized and tagged #GivingTuesday, 2005 Capital One Bowl, 4th generation onion farmer, Agricultural policy, Best Buy, black dirt, Bloomin' Onion, charity, Chris Pawelski, complimentary Bloomin' Onion, contribute, crop insurance, crowd funding, customer service, farm, farmer, farming, giving back, Giving Tuesday, Goshen New York, Home Depot, Iowa Hawkeyes, Iowa University, Iron Bowl, LSU, memoir, muck, Muckville, Muckville: Farm Policy Media and the Strange Oddities of Semi-Rural Life, Nick Saban, onions, Orange County New York, Outback Bowl, Outback Restaurant, public policy, Sears, Starbucks, thank you, The Crowd Funder TV Show, University of Iowa graduate by chrispawelski. Bookmark the permalink.